In 2006, Sarah oozed youthful over confidence. Born and raised in southern Ontario, Sarah had just moved to Vancouver, learned to traditional climb, and committed to an all-female climbing expedition to the Himalaya. She was ready to take on the mountains. But, her ignorant over confidence took a figurative fall when she took a literal fall into a crevasse in a remote corner of southwest British Columbia. Four hours later, with a broken arm and fears of a spinal injury, Sarah was plucked from the side of the mountain by a Search and Rescue helicopter. On that August day in 2006, everything changed. Fear entered her climbing for the first time. She couldn’t climb routes she had previously warmed-up on, without being overcome by fear — unable to climb higher, but too afraid to come down. Since then, Sarah has sometimes failed, and sometimes succeeded climbing in the mountains of southern Patagonia, Pakistan, India, Peru and closer to home in the Coast Mountains of British Columbia. 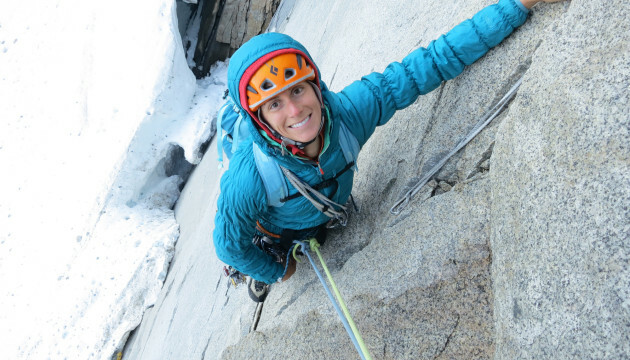 Join Sarah as she discusses what she’s learned about the balance of fear and confidence necessary to succeed in the mountains. One Response to "FEAT 2014 Speaker Announcement – Sarah Hart"
similar just about very steadily within case you protect this hike.